I'm continuing to get reports of huge numbers of tiny, fast-moving bright red mites scurrying around on sunny surfaces such as on picnic tables, patios, sidewalks, concrete retaining walls, and on the outside walls of homes and buildings. These nuisance mites belong to the genus Balaustium (family Erythraeidae) and are sometimes called "concrete mites" owing to locations where they tend to congregate. The mites prey upon other mites as well as small insects and are capable of supplementing their meat diet with pollen. Indeed, research conducted in 2012 at Wittenberg University (Springfield, OH) revealed that the mites often start the season as pollen-feeders and switch to becoming predators later in the season as more prey becomes available. The mites are primarily a nuisance pest producing small red stains on clothing when sat upon as my wife discovered wearing white pants. However, there have been reports in various medical journals that bites from these predaceous mites can produce dermatitis. The reports focused entirely on mites invading homes and other structures which seems rare in Ohio. It is unclear why concrete mites appear in large numbers in sunny locations in the spring. The mass gatherings appear to be highly seasonal and short-lived. Even if their numbers swell this spring, the onslaught will quickly subside. However, should these mites threaten to spoil outdoor events involving an abundance of white clothing, such as a spring wedding, they can be suppressed with a surface application of a pyrethroid insecticide such as products containing bifenthrin (e.g. Talstar). Do not confuse Red Grasshopper Mites (Trombidium holosericeum, family Trombidiidae) for concrete mites. 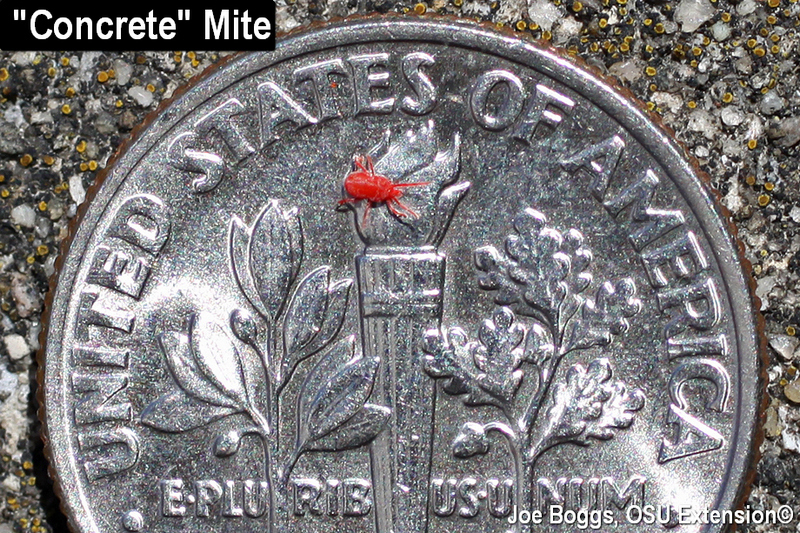 This predaceous solitary mite is one of the largest sized mite found in the U.S. They are sometimes called "red velvet mites" because the fine, soft hairs covering its bright red body which makes them look like they're covered in velvet. Red grasshopper mites are commonly found in Ohio woodlands crawling on tree bark in search of prey which includes insects. Immature red velvet mites feed like tiny ticks as ectoparasites on other arthropods such as grasshoppers and harvestmen (= daddy longlegs).